: for the Snowy Mountains Scheme is becoming a popular tourist centre. Population is approximately 300. 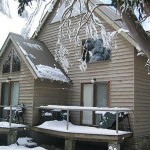 It is a is a Tidy Town award winner: and there is a variety of accommodation available. Enjoy the free historic nature display as well as films of the Snowy Scheme and Kosciuszko National park at the Khancoban Visitors centre. Welcome to Kosciuszko National Park, through which you will travel for the next 83kms. You will be able to see many signs of regeneration from the January 2002 bushfires. Drive according to road conditions, read & heed advisory road signs and enjoy your visit. One of Australia’s largest netting projects as a rock control measure, can be seen through the cuttings in the next 20 kilometres. You will see the grass trees on the slopes to the right are flourishing since the fires. Caution for rock debris & ice/snow on road on wet or wintry days in the next 20kms, do not stop in cuttings. 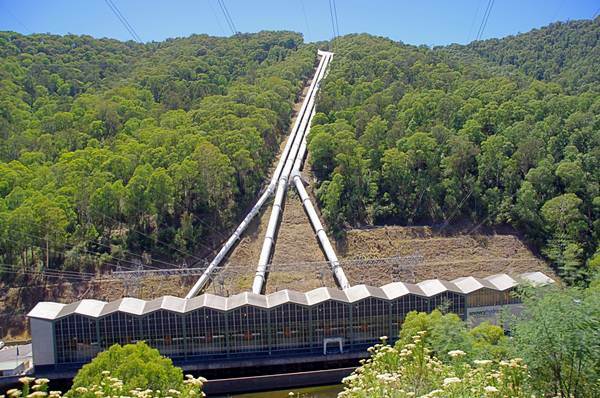 On your left, the pondage is situated at the junction of Back Creek and Broken Back Creek, and forms the reservoir for hydro functions of Murray II Power Station. 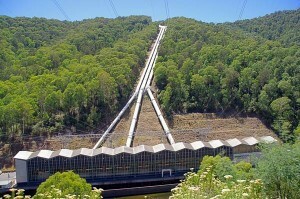 The white pipes carry water through the mountains for the Snowy Hydro Electric Scheme. Visitors centre explaining the Snowy Mountains Scheme. Interactive displays and cafe Closed weekends from May to September. The Alpine Way continues through forests of acacias (wattles) and peppermint gums. The ridge was so named by the Snowy Mountains Authority in recognition of the outstanding survey work carried out for the scheme by the late Major Clews. The ridge is covered with an impressive stand of Alpine Ash (Eucalyptus delegatensis). (Scammells Ridge is to the left). In the distance to the right you will see the famed Geehi walls and behind them, the Indi Range. The original route to Tom Groggin was over the Geehi Walls. Here is provided a spectacular panorama of the western face of the Main Range. Mt. Kosciuszko (2228m) hides behind the second peak from the right. You are looking from the bottom of Australia to the top – all in one view! Notice the changes in vegetation with altitude from the valley floor. at Scammels you will find good BBQ facilities and toilets. This moist environment provides excellent reptile habitat. (9.6kms) & GEEHI DAM (25kms) This road is closed to Geehi Dam in the snow season and may be closed due to other conditions (check the current status at the Khancoban Information Centre). Swampy Plains River Take some time to read the information displays in the area. Enjoy: the wheelchair access walking track (only a short walk) and the wildlife. The historic cattleman’s at the far end of the camping hut underwent major repairs after the January 2003 bushfires. In the next 20 kms marvel at nature at its best, regenerating the bush after wild fire. A cool & shady spot. White & Purple Veronica grows in the damp & shaded areas, ti-tree along the creek. The mixed eucalypt forest shows examples of Mountain Gum, Candlebark & Eurabbie. Caution for ice/frost/snow ahead on wintry days. The exceptional view is dominated by the Pilot (1828) and the Cobberas (1883) in the south The NSW/VIC border runs between the two mountains. The stands of tall trees with rough brown bark are Alpine Ash (a fire sensitive eucalypt). Travel slowly in winter conditions and avoid stopping. The highest point on the road (1580m). “Brumbies” (wild horses live in this area. Unexpected snowfalls in the past have trapped them, causing numbers to perish. The gap is the divide between the Snowy & Murray river systems. The road leading from Dead Horse Gap to Thredbo Village follows the ancient track used by the aborigine’s of the Ngarigo tribe which inhabited the Monaro Plains and the mountains east of the Great Divide. During summer months members would make the annual pilgrimage to the higher ranges to, feast upon the Bogong Moths, a tasty & nourishing delicacy. The trail is open to Bob’s Ridge for those who are suitably equipped & experienced in back country skiing’ & trekking. Let someone know where you are going & be prepared for sudden extremes in weather. Australia’s premier Alpine Resort is nestled in this beautiful valley. Thredbo is an all year round resort, no matter what time of year the chairlift operates daily for sightseeing. The chairlift is your entry point to walk to the top of Australia’s highest mountain and one of the Seven Summits, Mt Kosciuszko. Weather conditions in the mountains are extremely changeable so please BE PREPARED!! Take warm, waterproof clothing if you venture out for the walk to Mt Kosciuszko. 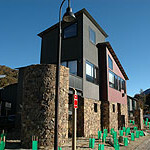 Accommodation, shops, and, Institute of Sport, Thredbo Golf Course ( nine holes ) , tennis bobsled. Walking tracks in summer and skiing in winter. Park Passes are available at the newsagency. On your left can be seen the Lubra rocks, a conspicuous granite outcrop. Note the line of demarcation between the upper “snow gum zone” & the lower forest of Mountain Gum & White Sally. This line would be at a level of approximately 1400m. Beside Thredbo River, Bullocks Track starts & finishes here, you have a choice of 3.3 or a 5km walk to Bullocks Hut. Day & Annual season tickets are available here. SKITUBE T Bullocks Flat terminal. This rail link through the mountain offers rapid transport to the Perisher Blue ski fields. Australia’s highest railway. Closed in the summer season. As you cross the saddle the gently undulating plains of southern Monaro stretch before you. The saddle formed as a result of step faulting during the Kosciuszko uplift at the end of the Miocene period approximately 30 million years ago. 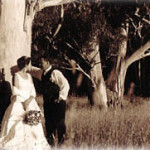 Early in the 1830’s this area was settled by the Pendergast family, the first white settlers in the southern Monaro. Several old pioneer type buildings can still be seen on either side of the road. on the shores of Lake Jindabyne, renowned for its yachting, boating & trout fishing. 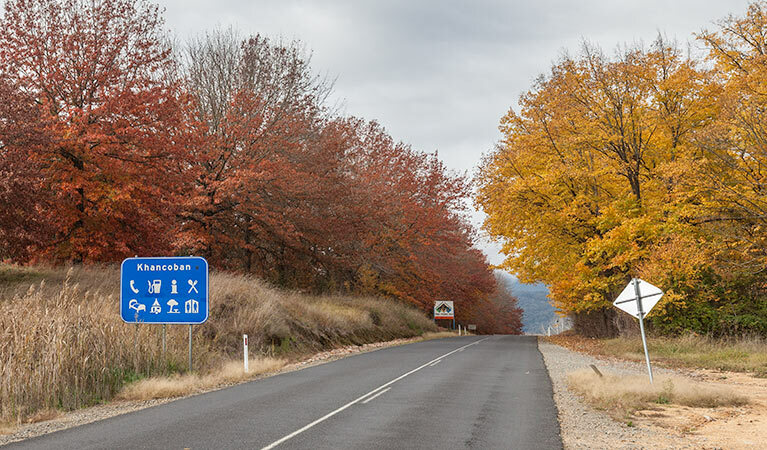 Turn right for Jindabyne & Cooma OR left for Sawpit Creek, Smiggins, Perisher & Charlotte Pass. During winter access from Perisher to Charlotte Pass is by over-snow transport only.